← Catching Up Yet Again. Sheesh. Eh, who like go back to Montana? ME!!! K’den. We go!! Last time, long time ago, we had just left the Best Western Motel in Orofino, Idaho. Best motel we’ve ever stayed at by far! I easily could’ve stayed there for days! There is a reason why this is called the Clearwater River. I picked this route to Bozeman because I knew we’d love travelling along this route. It meant taking much longer to get there, but it would prove to be well worth the extra hours. We’re driving along Highway 12 in Idaho, and we’re heading towards Missoula. We had no idea of the wonderful things that would happen along the way! It was such a lovely drive, and Nolemana and I were having a good time seeing all the new sights. Still heading East on Highway 12. Try look da poor bent over tree! A journey into Idaho’s beginnings. This is near the junction of Historic Highway 11, now designated as the Gold Rush Scenic Byway, which heads into Nez Perce country, where the Indians met Lewis and Clark. May along the Clearwater River. So nani! We just kept following this lovely highway. Traffic was practically non-existent, which made for a calm and enjoyable trip. I absolutely loved reading about the historical significance of the area. We were almost to Kamiah. We had no idea how to pronounce it. Ka mee ah sounds more Hawaiian and the way I was tempted to pronounce it, but I was pretty sure it was Ka mye uh. I know it snows a lot here, but ho, in the spring it’s clear, and oh, so beautiful. You can see that we were practically alone on the highway. No horns, no traffic, no tailgaters, just us and the lovely Clearwater River. Cool! Maybe something exciting will cross our path. Deer? Maybe. Moose? I doubt it. Bison? Nah. K’den. Deer or elk maybe. This is a boat launch along the Clearwater; there weren’t tons of fishermen here, but those that were must’ve been excited to get out on the water. These are wild lilacs growing up on the hillside. But they hadn’t bloomed yet. We took photos of these rock formations on the opposite side of the river for my friend, Izzie. She loves seeing them. We always try to plan our road trips during off-season times in order to avoid traffic, and we continued to be really happy at the absence of plenny cars. It was quiet along the Clearwater, and we were thoroughly enjoying our trip. And bless Nolemana’s heart. He was willing to climb up the hill and try to get me some starts by only using his pocket knife. He got them, but it wasn’t easy. (So ahem, this year for his birthday I got him a folding shovel (among other things) for situations just like this! We put the starts in water; sadly, they only lasted a week. They just didn’t have enough roots on them to make it. Onward we went, enjoying the quiet and the nani Spring day. Musubi was enjoying the ride as well. We came to another boat launch, this one at Long Camp. There was a historical marker there, too. 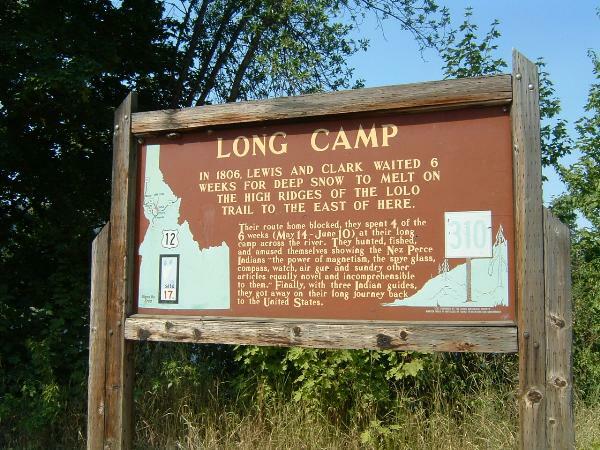 It said that Lewis and Clark waited here for six weeks for the deep snow to melt on the high ridges of the Lolo (no laugh, you locals!) Trail east of this location. They spent the time in their long camp across the river with the Nez Perce Indians. Then we continued on our way up the river towards Kamiah. Such a lovely, lovely, river! And a gorgeous drive… we were so happy we’d come this way! I’m really gonna keep this road trip updated. Really. I’m enjoying the journey all over again; good memories foa realz. Mahalo fo’ da trip Moki. Wish we could hav been deah too.m/ I like da “Lolo” trail. Ho da nani! Tanks fo taking us along too, Moki-chan!